Located in the heart of Thionville, this hotel is within 1 mi (2 km) of Hospital Beauregard and Parc Napoleon. IUT de Thionville and Regional Hospital Metz-Thionville are also within 3 mi (5 km). Thionville Station is 26 minutes by foot. Situated in Amneville, this hotel is within 1 mi (2 km) of Amneville Aquarium and Amneville Zoo. France Aventures Amnéville and Musee de la Moto et du Velo are also within 10 minutes. 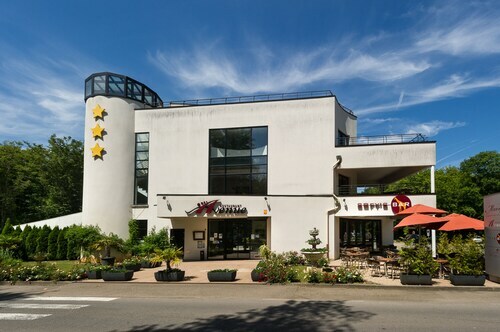 Situated in the suburbs, this hotel is within 1 mi (2 km) of Amneville Aquarium and Amneville Zoo. France Aventures Amnéville and Musee de la Moto et du Velo are also within 10 minutes. 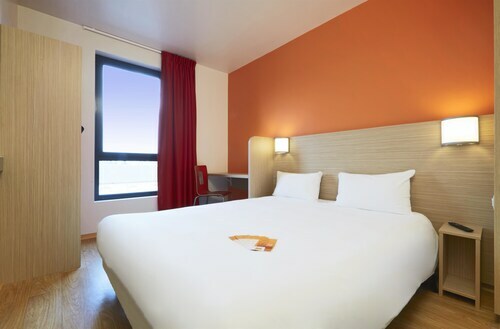 Situated in Amneville, this hotel is within a 15-minute walk of Amneville Zoo, Galaxie Mega Hall, and Thermapolis. Snowhall Amneville and Villa Pompei are also within 15 minutes. Gandrange-Amnéville Station is 30 minutes by foot. How Much is a Hotel Room in Bouzonville? Hotels in Bouzonville start at $44 per night. Prices and availability subject to change. Additional terms may apply. Want to explore Bouzonville? 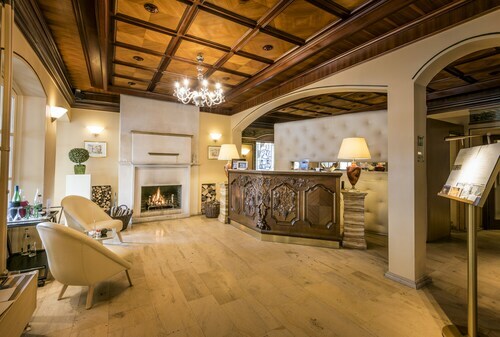 It'll pay to secure accommodations as soon as you know your itinerary, as there is just 1 place to rest and relax within a short driving distance of the center of Bouzonville. The Victor's Residenz-Hotel Schloss Berg, Rhineland-Palatinate, which is the closest Travelocity-listed place to stay, sits 18 miles (29 kilometers) from downtown Bouzonville. That said, you could look into the Mondorf Parc Hôtel, located in Luxembourg, which is 18 miles (29 kilometers) away. 14 miles (23 kilometers) from central Bouzonville, you will find the Landhotel Saarschleife. The Villa Welcome is approximately 18 miles (29 kilometers) away. Some more alternatives in the region include the La Grange De Conde Chateaux Et Hotels Collection and the Hôtel des Vignes. If you have the time, why not broaden your horizons and visit the other sights dotted around Alsace-Lorraine while you are in this area? Alsace-Lorraine is the home of rural landscapes. Commonly visited vacation places of interest are traditional villages. Common things to do in this particular region of France include mountain climbing and hiking. 19 miles (30 kilometers) away from Bouzonville, you can find Amneville, where you can spend a few hours exploring Thermapolis and Musee de la Moto et du Velo. 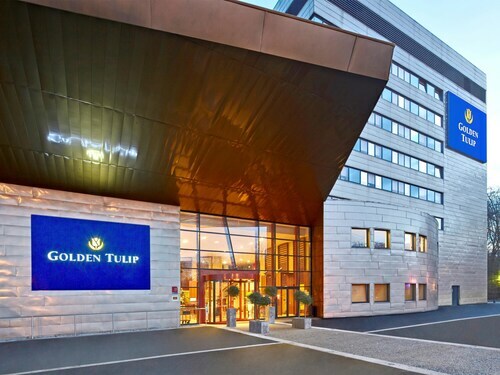 Some Travelocity-listed Amneville lodgings include the Golden Tulip Amneville - Hotel And Casino and Novotel Metz Hauconcourt. For another option, head to Thionville, 20 miles (32 kilometers) to the west of Bouzonville, where you have the options of the L'horizon Chateaux & Hotels Collection and Hôtel Domaine de Volkrange. If you visit Thionville, set aside some time to explore the Hospital Beauregard and Parc Napoleon. Just because you are on vacation in Moselle, should not mean that you shouldn't expand your obsession with a day at the stadium. Marcel Picot Stadium can be found 45 miles (71 kilometers) to the south of Bouzonville. Any sports fans that hope to find Travelocity-listed hotels in the area surrounding the stadium should look at the Hôtel d'Haussonville or the Grand Hotel de la Reine. Before you and your family depart for Bouzonville, don't forget to read our Bouzonville hotel and travel guide where you can learn about all the scenic attractions on offer. Friendl courteous staff. Completely remodeled with pools and spa . Hotel overlooks the Menge river with excursions available right out the door.